This season marks the 132nd season for the Giants baseball franchise. A team that began in 1883 (one hundred years before I started 8th grade), and still carries on a proud tradition. They’ve survived wars, one cross-country move (while escaping a second move to Florida in 1993), a strike, a major earthquake that postponed game three of the 1989 World Series and the steroid problems. One of the things I love most about baseball is that it is never over until it is over. Perseverance is the most important trait a baseball player can have. Not size or strength or superhuman talent. Sure, those things help, but the biggest asset a player has is the ability to never give up. The same thing can be said about writing. Or any dream worth pursuing. I started my first romance novel twenty years ago. Just playing around, really, a way to entertain myself when I was first married and we didn’t have cable. Just baseball on the radio and my imagination. Years went by, we started careers, a family. Bought a house. Upgraded. I quit teaching, tried bookkeeping, stayed at home with my kids and volunteered in their school. I joined the Little League board and kept myself busy. But I secretly wrote along the way. When I worked full time, I wrote about a career woman quitting her job and entering the world of playdates and competitive preschools. I wrote an inspirational secret-baby spy thriller told almost entirely with wine-induced flashbacks. That was the first book I finished, but it will never be published. Finally in 2010 I finished my second book. This time I felt like I could take the next step. I started researching agents and publishers and how to submit. Along the way, I discovered Romance Writers of America. There was a chapter that met in Sacramento, not far from my home. I couldn’t make the next meeting, because it was opening day of Little League, but I signed up as a guest for the following month. I met with many amazing and welcoming writers. I felt completely over my head, but also like I belonged there. So I went back. I’ve learned about the craft and business of writing about how to pitch (not a baseball, but a book) and after almost three years I had signed my first publishing contract, and today is the debut of my first novel. But I almost gave up on Better Than Perfect. I had received several rejections, most of them as a form letter. I got a few suggestions, encouraging me to keep writing but I wasn’t quite there yet. I was getting frustrated because I wasn’t sure what was wrong with my book. I was getting requests to my queries, but then…nothing. So I was really excited to win a critique by an author on a blog I follow. I sent off my first 50 pages to her at the same time as a few agent and editor requests. I got a couple of rejections, again generic. One even spelled my name wrong and it ended up in my spam folder. But I kept at it. Savvy Authors hosted a “Pitch Perfect” event the month of April. They set up several agents and editors to take pitches on their website. I’d already submitted, and been rejected by a couple of the agents/editors on their list. But there were a few that I hadn’t yet contacted. I got two requests right away, and sent the required partial or full manuscript. One of the editors I pitched to didn’t post the results right away, so I had to check back. In the meantime, I got my critique back. It was like my dental hygienist—very thorough and painful. I couldn’t finish reading it. I know she was trying to be helpful, but I was pretty down. I figured Johnny Scottsdale was destined for the disabled list, maybe permanently. I was working on the second book in the series, but I stalled out around chapter ten. I wasn’t ready to give up, but I felt like I was down to my last strike. I checked the Savvy Authors website and sure enough, the last editor wanted to read my manuscript. I sent it, thinking if I was going to go down, I’d go down swinging. The next day she sent me a quick e-mail telling me how much she looked forward to reading it. There was no “but.” She wanted my book. A week later I had signed the contract with Lyrical Press, which is now an imprint of Kensington Books and I have since signed a second contract for Worth The Trade, due out in July. So yeah, sometimes you can be down to your last strike, and with one swing of the bat (or click of the mouse) you can hit one out of the park. Thank you for having me on Just Contemporary Romance. I am so excited to share my book birthday with you. I'll check back throughout the day. Hi Kristina - good luck with sales and congratulations on getting your baby out there. Thanks for stopping by. I feel like I should shout from the rooftops that my book is "Alive" but I doubt there is anyone in the neighborhood who hasn't heard and seen my cover a million times already in the last few weeks. Still, you only get one first time. This is my first visit to this site. This sounds like a really good book. And wowee, love that cover! Welcome Brooke. I've been lurking on this site for quite sometime. 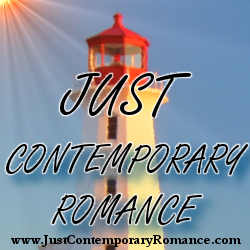 I love contemporary romance and have found some great reads. This is my first time posting as an author and I hope you get a chance to check it out.